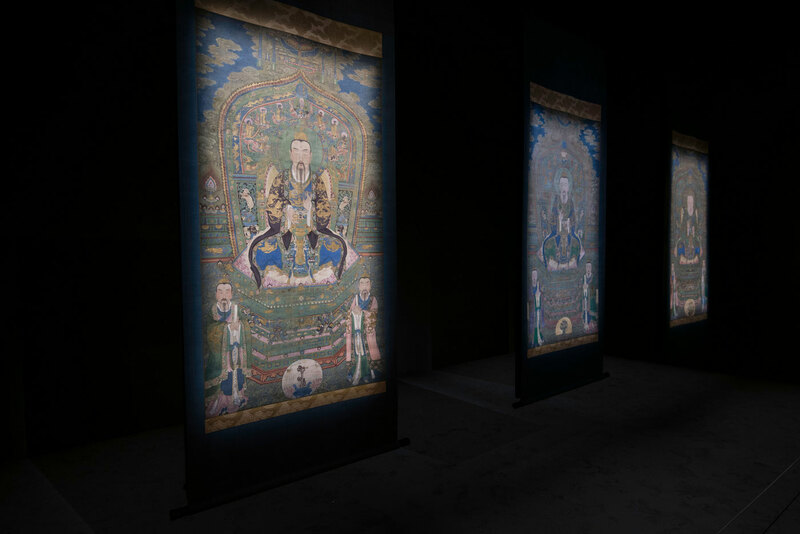 The Minneapolis Institute of Art (Mia) collaborated with theatre director and visual artist Robert Wilson to organize a first-of-its-kind exhibition highlighting the drama, rituals, and opulence of the Qing Empire, the last imperial dynasty of China. 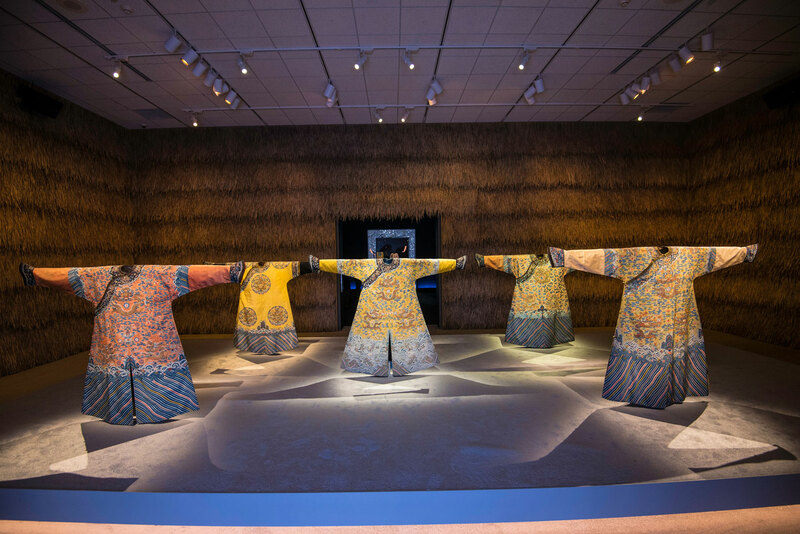 The exhibition presents objects from Mia’s renowned collection of Chinese art, including rare court costumes, jades, lacquers, bronzes, gold ornaments, paintings, and sculpture, displayed in an immersive, experiential environment conceived of by Wilson. 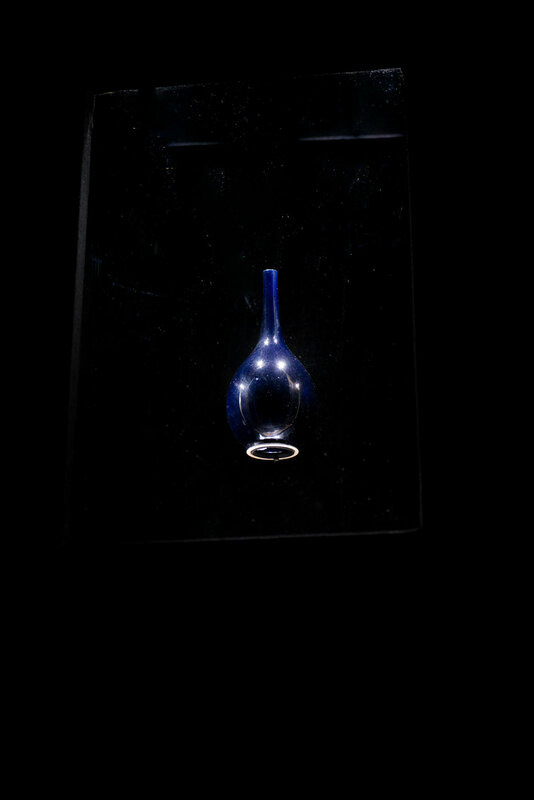 “Power and Beauty in China’s Last Dynasty: Concept and Design by Robert Wilson,” is curated by Liu Yang, Mia’s Curator of Chinese Art, and is on view February 3 through May 27, 2018. 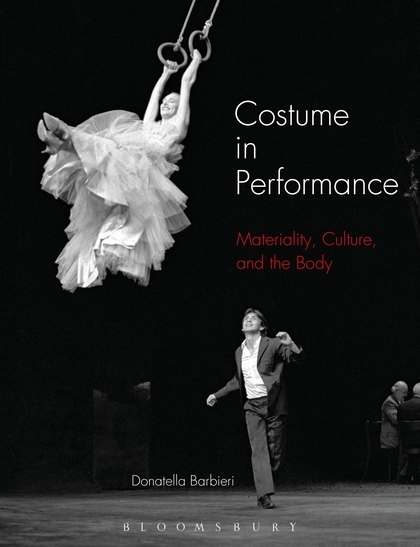 Costumes worn at court are given particular attention in the exhibition, including the display of exquisite robes heavily embroidered or woven with symbolic designs such as roiling waves and faceted rocks that evoke the earth’s oceans and mountains, or stylized clouds that suggest the heavens. Dragons, a longstanding symbol of imperial authority and might, often cavort in the clouds, suggesting the emperor’s rule of heaven and earth. These symbols are also repeated on other objects throughout the exhibition and help reinforce the sense of the imperial family’s rule as mandated from heaven. 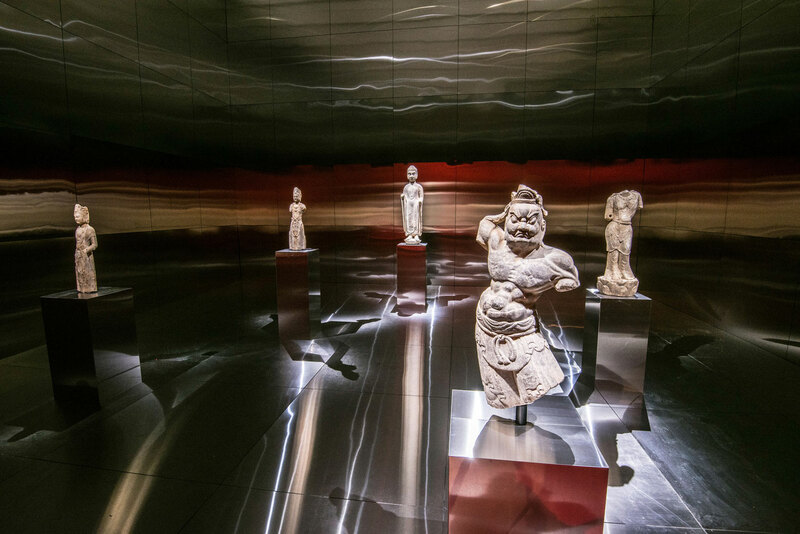 The exhibition progresses through a series of ten galleries that lead visitors from the performative, external world of the imperial court to the intimate, interior world of the emperor. The sequence of galleries explores different aspects of imperial life, from the almost bureaucratic devotion to hierarchy and the emperor’s omnipotent control of the court to the politically expedient splendour of religious devotional objects. 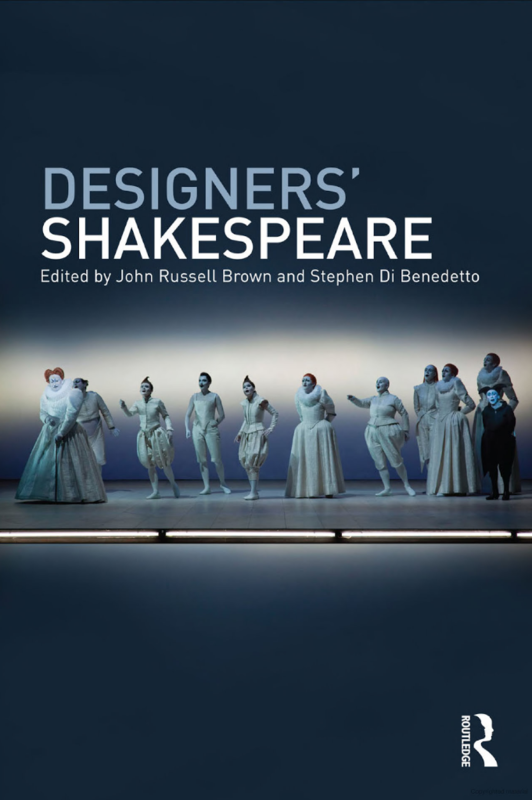 Each gallery also features an original soundscape created by Wilson, in collaboration with sound designer Rodrigo Gava, and dramatic lighting by designer A.J. Weissbard. 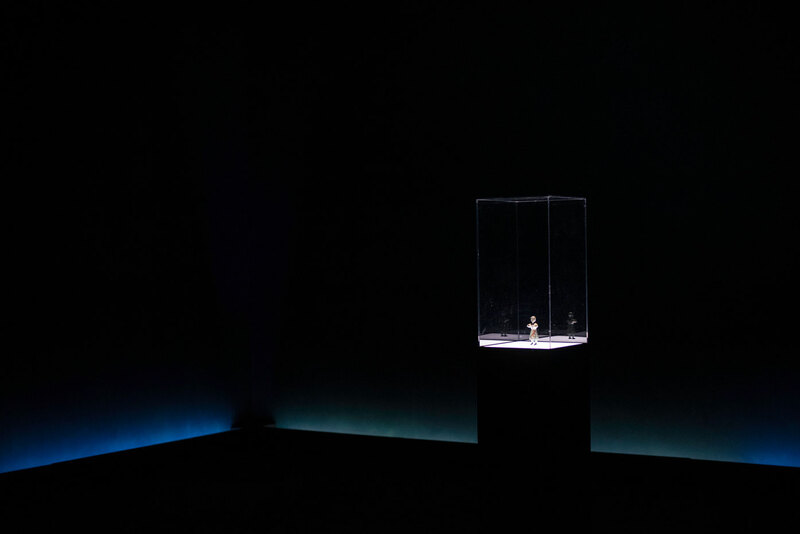 To set the stage, visitors enter a small, darkened gallery with a single illuminated object and a subtle soundscape, encouraging them to settle their minds and leave behind the 21st century as they enter the world of the emperor. In juxtaposition, the second gallery embraces the extreme of opposites. 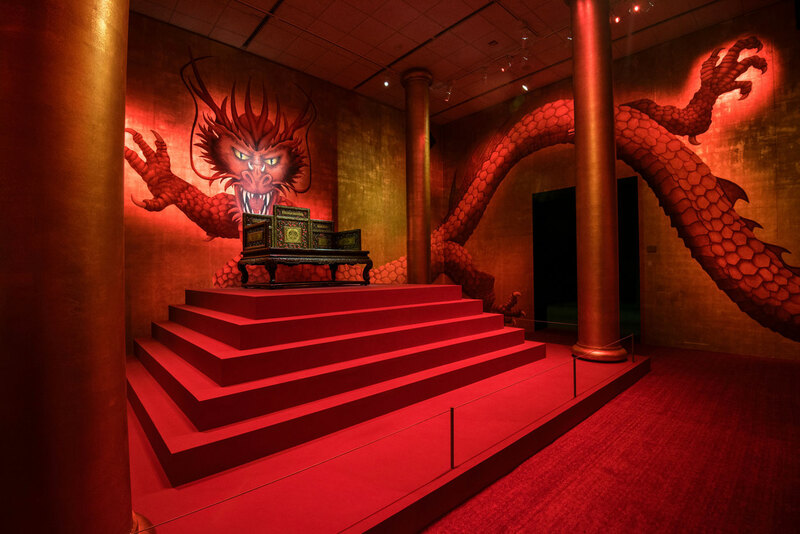 Brightly lit and displaying approximately 200 objects including: carved lacquer boxes, bronze altar pieces, jades, gold ornaments, gilt bronzes, porcelains, and furniture—the gallery will emphasize the range of artistic creation throughout China’s long history and the force of this tradition on the Qing emperors. 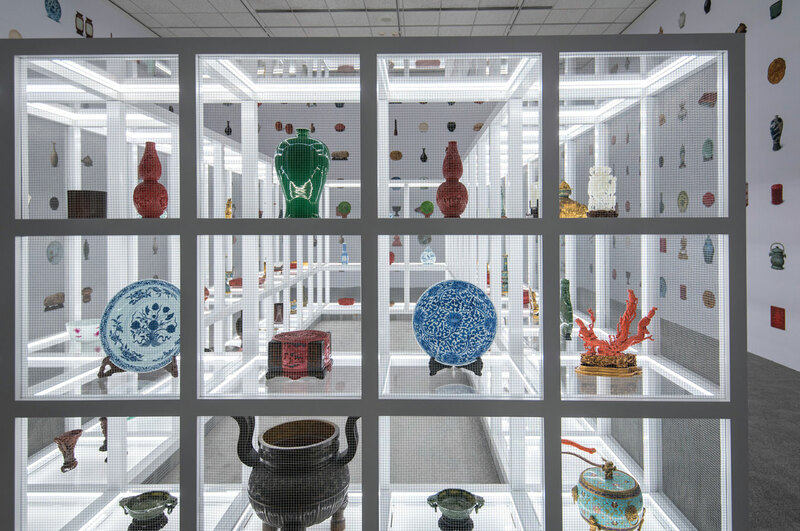 An adjacent gallery seeks to recreate the sense of authority and awe inspired by meeting the emperor in his throne room. In this room with gold-leafed walls that evoke the opulence of the Hall of Supreme Harmony (Taihe dian) in the Forbidden City in Beijing, an imperial throne from the Qianlong period (1736-95) is raised on a dais with stairs on three sides, four large pillars surrounding it, and a large dragon painted on the wall behind it. The soundscape emphasizes the fearsomeness of the emperor’s power by relying on percussion instruments performing ceremonial music, punctuated by intermittent screams. Another gallery focuses on the court life of noblewomen. 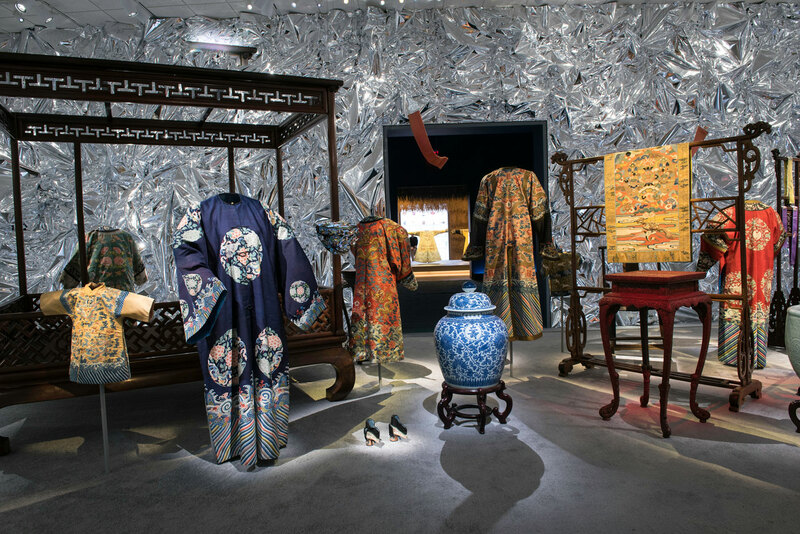 This room highlights the artistry developing in gold and silver production in the Qing period and the development of sophisticated technology for clothing manufacture, which created a remarkable material culture of garments and adornments. The aluminum-foil wallpaper of the gallery is designed to suggest a lavish and extravagant lifestyle, yet with a poignant soundscape that undercuts the display. A sad, bitter melody is played on the erhu (a two-stringed instrument), but unexpectedly interrupted from time to time by the sound of female giggling—a symbolic reference to the destiny and experience of Chinese women in the imperial court. 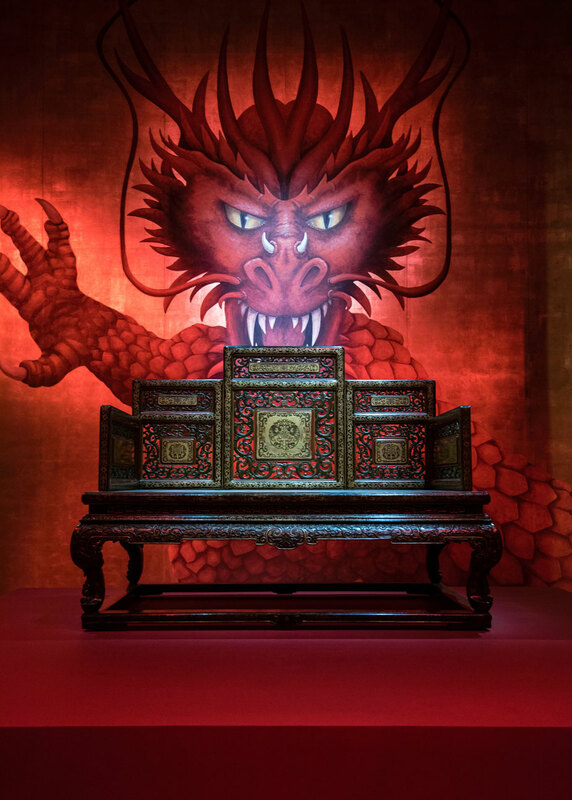 Together, the galleries vividly bring to life an intimate and dramatic sense of the imperial court during China’s last dynasty.